Bromio has revealed that Pato Box, an adventure / fighting game inspired by Punch-Out! !, is on the way to Switch. It’s due out on the system sometime this year. You’ll play as Patobox, who strangely has a duck’s head on a man’s body. After he’s betrayed by his sponsor Deathflock, you’ll be tracking down his henchmen and discovering the company’s secrets. It’s all wrapped up in visual style that takes after graphic novels. You can find more information and a trailer for Pato Box below. 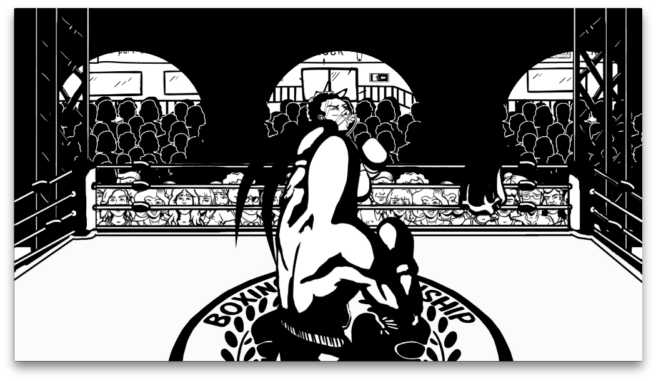 Pato Box is an adventure and fighting game inspired by the “Punch-Out! !” series, taking place in the building of a corrupted corporation. You play as Patobox, a boxing champion with a special distinction of having a duck’s head in a man’s body. He has been betrayed by members of Deathflock, the same company that has been sponsoring him during his career. Patobox will find retribution by finding Deathflock’s henchmen while discovering the dark secrets the company hides and the truth behind his treason one fight at a time. Dive through Deathflock’s building, explore and encounter a series of intense fights that will test your reflexes and awareness while Patobox’s story reveals itself. – Innovative visual proposal inspired by the style of graphic novels. – Original artwork fights mixed with a 3D world environment that feels just as if you were inside Patobox’s graphic novel. – While you explore the world of Patobox in unique areas with traps and minigames, a story filled with mystery, flutter and tension will unfold. – Using boxing techniques find and fight 7 different bosses with unique abilities and mechanics. – Hidden collectables to expand the story, unlock “hard mode” and test the player’s abilities.